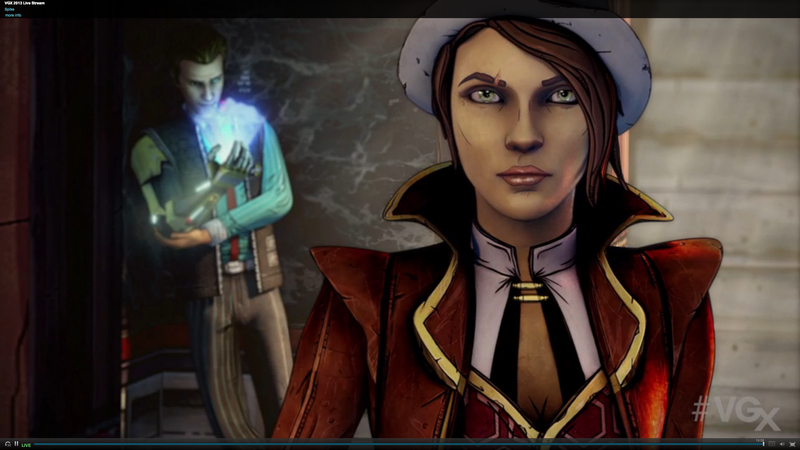 They're going to call it Tales from the Borderlands, and it's debuting next year. It appears to star some new characters who are not vault hunters. They're "wannabe vault hunters," according to Gearbox boss Randy Pitchford. The game is described as very much a Telltale game, with lots of story to it. A short trailer at tonight's VGX teased what's got to be a dream collaboration between the makers of one of the most popular multiplayer shooters around and the makers of some of the best story-driven games going. "You get to shoot stuff, but in a different way," said Telltale's Kevin Bruner at the show. "It's gonna play like a telltale game—you're going to be engaging characters and developing relationships, but it's very much in the borderlands world. It's this great hybrid of everything that's great about Borderlands and everything thats great about Telltale." Hopefully the game is as cool as it sounds. Borderlands was already proof that a combo of shooter and loot-based RPG could work well. A combo of Gearbox and Telltale sounds pretty damn good, too. Telltale is launching the first installment of their second season of their Walking Dead series later this month. They also just released a game based on the Fables comics and are rumored to be working on a Game of Thrones series. That's a mighty fine line-up.